We’ve previously given you a few tips on using Google Buzz for mobile, and today we’re focusing on the Buzz layer in Google Maps for mobile. As many of you have found out, location puts a different spin on Google Buzz, adding context to posts and letting anyone find relevant public posts in a natural way -- on a map! We wanted to share some tips on a few creative ways we’ve seen you using the Google Buzz layer. If you’re exploring a new area and looking for tips, post a question, and someone browsing Buzz in the area may be able to provide a quick answer. A few weeks ago on President’s Day, I was hanging out in the Russian Hill neighborhood of San Francisco. Rather than take my chances, I posted a question asking what the parking rules were. A friendly local soon informed me that I’d be free of parking stress -- meters were enforced but permit parking was not. Even if you could type 100 words a minute from your phone, sometimes a picture tells a different story than words could ever describe. Google Maps for mobile or the Android Buzz widget lets anyone share a picture of their favorite dish or the funny street sign they’ve found. Just attach a photo to your post or take a new one before posting. We’ve found great cases of citizen photo journalism on the public Google Buzz layer, such as traffic accidents blocking roads and location-tagged Picasa Web Albums showing the earthquake recovery in Haiti. 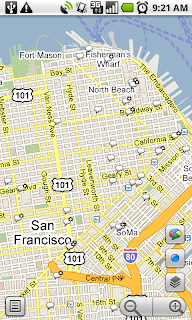 Google Buzz posts you create in Maps will always include your location (i.e. “My Location”) by default, but you can easily change the approximate location to a specific place, such as a restaurant. For example, change the post’s location and select the restaurant from the suggestions list before posting to give a recommendation or tip. Alternatively, you can search for the restaurant in Maps and select the Google Buzz option from the search results page (the post’s location will automatically be the restaurant). Now, people reading your post will know that your recommendation is about that exact restaurant, and your recommendation will be available for anyone browsing that restaurant’s search results page. Because we built Google Buzz in Maps for mobile to let you share information about places with the world, posts from Maps are always public to the web and include a location, either your approximate one or a specific place you choose. To get started, install the latest version of Google Maps 4.0+ on your Android 1.6+, Windows Mobile, or Symbian S60 phone (BlackBerry coming soon; see availability details) by visiting m.google.com/maps on your phone and going to Layers > Buzz from the Maps main menu. From Android, iPhone, and iPod touch devices, you can also use the buzz.google.com Nearby view and map just like the Maps layer. When will the updates for android on the G1 be coming??? g1 owners have been the most loyal, longest users of android, and it seems like we are being dissed. Is that how you treat your oldest customers? I've been something of an avid user of precisely this feature, which is by far the most unique and interesting aspect of Buzz. But that's exactly why the lack of a Buzz Maps desktop layer has been so frustrating. The only people who can get in on the action are Android 1.6+ mobile users. Bringing that "nearby" layer to the DESKTOP and making it a core part of the gmail-client experience is critical. Even home computers have locations (and often they are mobile laptops), and even home users would "get" Buzz better if the concept of people in their local area annotating the world around them was made real and immediate. Why I still do not have the Buzz layer even after upgrading to Maps version 4.1.0? I'm using Nexus One on Singapore network. Are there any plans to make any Buzz functionality to PalmOS? I know it's old, but I love me my Centro and I'd love to be able to keep up with the Buzz on it--I can get Facebook and Twitter on their mobile Web sites! Surely a stripped-down version of Buzz could be put in place! Seen that Android's plans to make money is to make internet everywhere with the best possible experience (as with Chrome and Chrome OS), I'm really surprized that they didn't think the problem of upgrading phones OS before... Sure there was an announcement about upgrading all phones to the latest available Android on each new version, but if it takes all this time, then users are having different experiences of Android apps and the overall image is very impacted. Phones Brands are reticent to upgrade their phones because this makes them sell less new phones, I hope the Nexus is a reaction to that: to make the last system available immediately and therefore somehow oblige the other brands to follow the rythm...(if it's the case then congratulations for the idea, but this could mean the upgrades will apply starting from the 2.0: so it's dead hope for my old phones). I have two Android phones G1 and Hero, both are on the Android 1.5. I hope this will change fast. 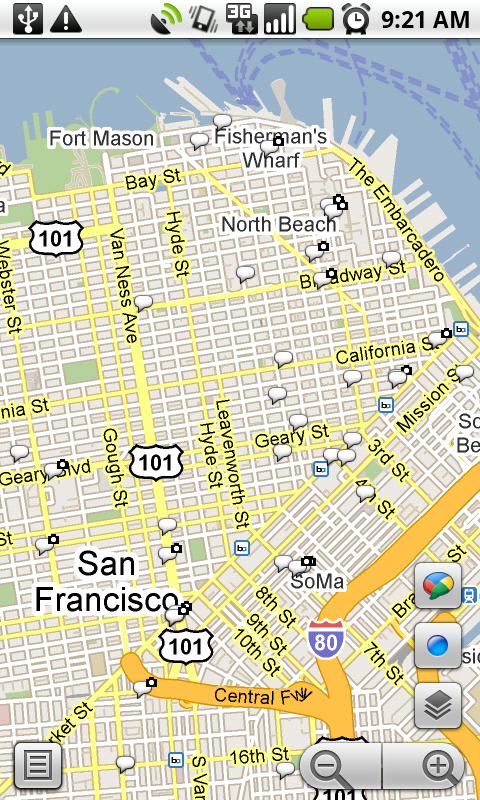 I've been a frequent user of Google Mobile Maps and also Buzz and Latitude on it. 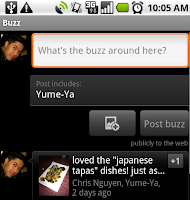 However a Buzz App for Symbian is what I'm really looking for among other things. When can we expect a heads up this way? Great app but there is no buzz layer in Google maps 4.1 that i'm currently using on my nexus one in Thailand? I'd love to see buzzes around me.. any body knows more about this? I hate to keep beating this horse, but it's not dead yet. You guys need to figure out a way to allow people to post location buzzes with photos from iPhone and other non-android devices. 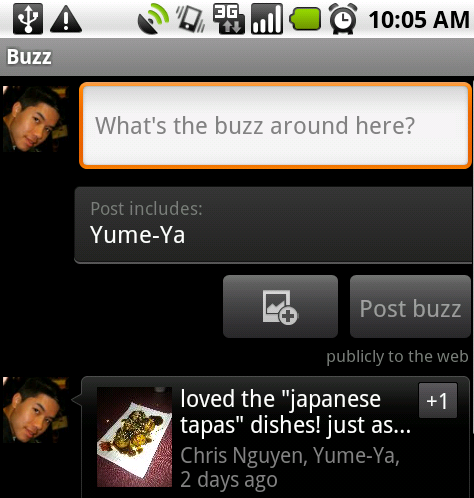 I would use buzz a lot more than I currently do if I could post a location photo, but alas, I can't. Very useful widget. Now we just need buzz to get used more.